Curiously, the court did not cross-examine the surgeons. Surgeons' evidence could also favour the defendant's case. The complex relationship between surgeons' evidence, verdicts, and the pardon process is apparent in the trial of Alexander Cameron for murder in 1775. Cameron was indicted for the beating death of his wife at St. John's. Since no one had witnessed the homicide, the prosecution opened with circumstantial evidence. Several witnesses recounted how they had heard suspicious noises in Cameron's apartment during the night Margaret Cameron had died. William Roy, a neighbour, testified that the accused had called out that his "wife was gone," upon which he went to Cameron's room and found the deceased lying on the floor unconscious. Roy reported that he had seen bruises on the body—other witnesses also related past episodes of Cameron's beatings—but only the surgeons' evidence directly connected the assault to the homicide. Signed by Thomas Dodd and two other surgeons, the post mortem report stated that the body was "of a healthy make," and they were "of opinion that the blows she received on the breast, abdomen and thighs are the immediate cause of her death" (Bannister 1998 123). 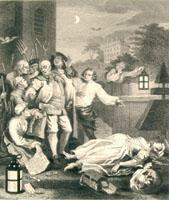 Engraving by J. Romney, from the original by William Hogarth (1697-1764), and entitled "The Four Stages of Cruelty. Cruelty in Perfection." From J. Trusler, E. F. Roberts, and James Hannay, eds., The Complete Works of William Hogarth (London: London Printing and Pub. Co., 18--) 134. Curiously, the court did not cross-examine the surgeons. Given that the deceased had suffered from no known illness, the findings of the post mortem were perhaps not a moot point. Yet the absence of any discussion of the medical evidence is likely explained by the fact that Thomas Dodd sat as a judge in Cameron's trial. Unlike D'Ewes Coke, who had no known affiliation with the surgeons whom he examined from the bench, Dodd was obviously not in a position to question his own medical expertise. With Cameron's defence resting essentially upon his previously respectable social status, the jury found him guilty of murder. In their report the judges recommended mercy on the grounds of doubts whether there had been real intent to murder and, perhaps more importantly, because of Cameron's "known good character." Although the conviction hinged on post mortem evidence, neither the judges nor the governor commented upon it in their letters, and Cameron was granted a free pardon. Throughout this process contemporary attitudes toward violence against women unquestionably encouraged both the bench and the government to favour mercy. Surgeons' evidence could also favour the defendant's case. In the trial of Thomas Crew for the murder of Darby Reardon, a servant in Crew's employ, the post mortem report proved crucial to the defence. Crew was indicted for fatally beating Reardon at Trinity in January 1779. Six men who had witnessed the homicide had given depositions before a naval surrogate and two magistrates, and testified at the St. John's assizes. The basic facts of the homicide were not disputed: the two men had argued near the waterfront, had fought each other with sticks, and Reardon had fallen through a hole in the wharf and was taken up dead. Crew had stuck Reardon in the head just before he fell into the water and had summoned two surgeons to try to save the deceased. The question before the jury was whether Reardon had died as a direct result of injuries inflicted by the accused or had drowned under the wharf before he could be rescued. After hearing this testimony, the court turned to the post mortem examination conducted by three surgeons in Trinity—D'Ewes Coke, John Clinch, and John Mills—at the request of the naval commander overseeing the homicide investigation. [That] by the surgeons of their strict examination of the body according to the orders of Captain Durell, and that the said Reardon's death could not be occasioned by that single contusion on the hinder part of his head ... which 'tis certain I could not have given him therefore my Lord I resign myself into the hands of our Lord Jesus Christ and your just judgement (Bannister 1998 124). Surgeons' evidence played a major role in both trials. What surgeons left unsaid was as important as their actual testimony: they plainly exercised discretion as both medical practitioners and civil magistrates. Their relative silence in the trials of Cameron and Crew meant that potential reservations about the post mortem evidence were not aired in front of the jury. Medical evidence alternatively worked to secure the accused's culpability or to raise persuasive doubt whether wilful murder had been committed. Either way, the trial jury returned a verdict that conformed to the findings of the post mortem examination.